If the Starbucks “Race Together” campaign had turned out to be carefully thought out, intelligent, sophisticated and responsible, and not a facile, condescending and cynical effort to promote a brand while creating static and white noise in the midst of an important cultural discussion, I would be obligated to apologize for doubting CEO Howard Schultz’s wisdom and ethics. It would also have been an apology I would have enjoyed making. Sadly, I was not only correct in my assessment that this was a fiasco in the making, I was more correct than I suspected. 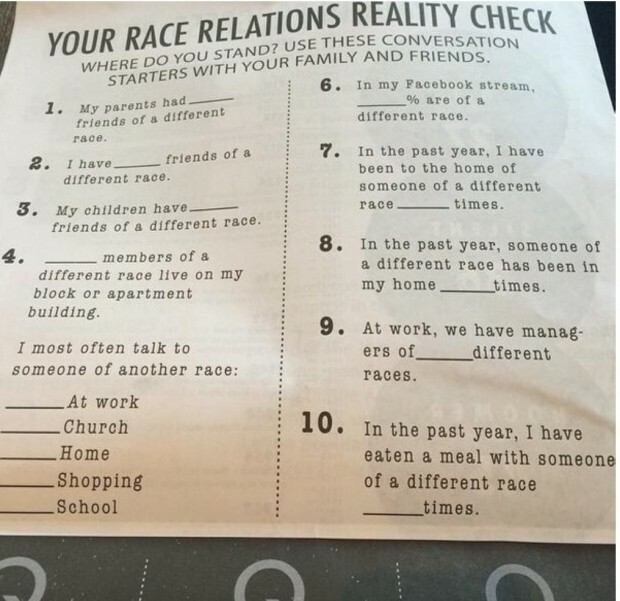 Above is the “Race Relations Reality Check ” quiz that Starbucks has reportedly been distributing. The questions indicate a bottom-of-the-well level of comprehension about race and racism, not to mention demographics, culture and the human species. It appears that Starbucks favors some kind of affirmative action program on personal friendships, and believes that one can measure racism or incipient bias by how many individuals of other races one has regular contact with. I don’t even want to have a discussion with someone this shallow. A whole corporation this shallow is a nauseating thing to contemplate. A corporation this shallow that presumes to lead a national discussion on race is, oh I don’t know—Risible? Sad? Dangerous? Starbucks seems to be thinking like George Costanza, during the period where he was trying to acquire black friends and managed to annoy and insult every African-American he met. The presumptions here are staggering, and so directly contrary to life, logic and the realities of human existence that i get angry just reading them. I was at an ethics conference in Nigeria, and met some of the most intelligent, charming, passionate people I have ever encountered in my life. I would be honored and enriched to have any of them in my life, and would hope that I could develop close friendships with them—but I can’t, because I live in the U.S. and they live in about 15 African nations, and it’s just too darn expensive to dine at each others’ homes. I live in an area, Northern Virginia, that is overwhelmingly white, not because it is white, but because it is convenient to my work and we found a great deal on a house. I work in two fields, theater and ethics, that do not afford a lot of contact with African Americans. The last time we had anyone other than immediate family to dinner was a decade or more ago; the last time anyone other than family, black or white, had us to dinner was longer ago than that—and I am a delightful dinner companion. I went to public school in Arlington, Massachusetts. There wasn’t a single black family in what was then the largest town in the U.S., until one black family moved in. Their son, a couple of years younger than me, was an instant celebrity: handsome, athletic, brilliant and popular. I never got to know him. In my college, there was a new affirmative action program, but the black students were uncomfortable and stayed pretty much to themselves. I had a Hawaiian roommate, and through him met other Hawaiians, including several Asian-Americans. We were all friends, but my roommate was troubled and committed suicide, and the Hawaiians all went back to Hawaii. It’s tough to have them over for dinner too. I had two black college friends, and had a desperate crush on a young black actress, but one of my male black friend died young, the other proved to be an insufferable jerk, and the lovely young woman thought, correctly, that I was a dork. In law school, my class section had no black students. I made one lasting African-American friend in the theater company I started there, and had several others whom I have not kept in touch with. At work, I had a few black colleagues, and hired several staff members who were African-Americans—two of whom sued me, by the way, because you literally cannot fire an African-American for cause without risking being sued. I made several friends in my journeys to Mongolia, and had one of them to our home for Thanksgiving years ago, and loaned her a car for a couple of weeks—but she’s back in Mongolia now. Again, it’s really inconvenient for me to go to her home for traditional Mongolia horse spine, lard and onions. What does any of this say about race relations or me? Nothing. What does the quiz reveal? That people meet and make friends with those who are around them? That individuals tend to gravitate to those who share their likes, dislikes, experiences, tastes, habits and interests? Or does Starbucks really think that you have a problem if the racial distribution of your friends doesn’t match the demographic percentages? They say there is still confusion among workers about how this will work. Prater and his coworkers spent the first day of the roll out wondering about the logistics. “My first reaction was, how do we go about this in the workplace? When I hand out a Frappuccino, I have 40 seconds to talk about race while I’m trying to make drinks,” he noted. “How long do you talk about this? What do you talk about?” He said not a single customer discussed race or the project with him or his coworkers. “This doesn’t seem like the venue for that kind of a thing,” he added…Jamie also pointed out that previously, the company has had an explicit policy that employees weren’t supposed to talk about politics on the job. “I remember when the Republican National Convention came through, just as an example, Starbucks sending something saying don’t engage in political conversations, when you’re wearing the green apron you’re representing the company,” she said. “But now we’re being told to do the exact opposite.” Even so, she doesn’t think it will take in her store. “Not a single person in my store is probably going to do it,” she noted. Well, of course. The employees are smarter than their boss, apparently. Sure you can. You properly attack them when their effort is recklessly conceived, does more harm than good, and exploits a serious social issue to get publicity and sell coffee. Jones is at least consistent: this has been the mantra of those trying to redefine “successful” so that the disastrous Obama years can be called a “success.” Even ill-considered, badly planned, incompetently-executed initiatives should be judged by their goals, whether the goals are met or not, whether the plan was sound or not. Wrong. In fact, dangerously wrong. A badly conceived initiative to “address” a problem (this idiotic Starbucks campaign doesn’t seriously address anything except getting the company’s name in the paper) will fail, and inhibit future, better initiatives that might have a chance for success. Jones’s solution to that problem, incredibly, is not to acknowledge that a lousy plan is lousy. This man is paid to enlighten the public about current events. My hat is off to those baristas who refused to get involved in this garbage and are rightly not interested in initiating difficult conversations with patrons, most of whom probably just want their damn coffee. It’s one thing if Schultz wants to funnel money to causes he agrees with and then take the heat for it, but it isn’t fair to put poorly paid kids in the firing line. I for one very rarely drink Starbucks just on a practical level. I think it is overpriced for what you are getting and you do better at Dunkin Donuts simply on the coffee end of things. Frankly I find the addition of a side of liberal politics with my coffee and muffin tiresome at best, irritating at worst. That said, Starbucks’ base isn’t professionals approaching middle age like me, and it’s probably not even families. It’s twenty some things, liberal gentry, and aging hipsters, who’ll all agree with this crap anyway. They are just playing to the base. Jack- interesting that the end result of the campaign (whether you agree with the mechanics or not) was perhaps exactly what Howard Schultz was aiming for, to elevate the conversation. There are plenty of awful CEOs with no leadership skills, really bad ethics and integrity, and worse short-term agendas. You don’t have to look too hard to find them. Howard is not one of them, even if you don’t like Starbucks coffee. Mike Brown provoked a discussion about race too. This is really an absurd rationalization. A trivial, non substantive, ignorant discussion of race is to nobody’s benefit. And your last sentence is proof of what I wrote. Schultz doesn’t care about race, just exploiting it for sales. Jack- how much do you know about Howard Schultz? Like I said, maybe you can find a more deserving CEO to pick on. The fact is, he is one of the few CEOs talking a long-term stakeholder view, and recognizing the role of the corporation as going far beyond meeting shareholder needs. It’s no accident that the company is doing as well as it is. I am not making general statements about Schultz, just this incident, which is unequivocally irresponsible and offensive. I don’t care what he has done or will do—it doesn’t change this. Jack- you said: “A whole corporation this shallow is a nauseating thing to contemplate.” That’s a pretty general statement. This is not a shallow corporation run by a shallow leader. I’m sorry you don’t care to acknowledge that. Why would he “acknowledge that” when he disagrees with your assertion? I’m on the same page. I also don’t have to worry about running into this campaign, as I find starbucks drinks to be burnt and over sugared. Was this accidentally perfect or are that truly subtle? When I hear words like diversity, I cringe. It’s usually spouted by people who really don’t want true diversity, but homogenization. One big happy family, one culture, one political system, one mode of thought, no freedom of association, and no dissent No discrimination. Discrimination is a bad word now. We’ll very subtly and cleverly make it analogous to hatred of an entire group of humans based on some superficial characteristic like skin color and nothing else. If you happen to be discriminate in your judgment of ANY subsets of people’s in-groups, like their cultures or political systems, you’re discriminating. I think there’s a form of this at work in people who accuse others of racism when they criticize Obama. I have good friends from Africa (Uganda, Rwanda, the Congo,and Somalia) and one from St. Lucia. All are very refined, squared-away people. Another thing they have in common is their disdain for American inner-city blacks. I’ll bet most people’s immediate reaction to that is to assume that they’re being superficial and making an unfair generalization. In actuality, they’re rejecting that culture, or lack thereof. It can’t be assumed that they wouldn’t judge people as individuals, and this can’t be based on skin color. There now seems to be an inseparable link between judging someone on their individual merit and racism. This is at least partially due to the power of language. Language defines the boundaries of our reality in a very material, conscious way. At some point, we may lose our ability to discriminate entirely, and we won’t know up from down. I don’t think that’s an accident.